Do you want to add wow factor to your home? If yes, then embrace the ethnic eclectic. It is not a new decorativeidea for home renovation, however, it has now got the recognition it deserves. The emerging styles of ethnic eclectic are one of most fun decorative styles to utilize for the home improvement. Do you know what is ethnic eclectic exactly is? This type of décor scheme involves a combination of more than one ethnically representative style of different regions within a single room. Ethnic eclectic can be any room with the combination ofaccessories of different regions and countries like a room having décor items such as Turkish rug andItalian table with German crystal accent pieces. You can say interchange the term as “international room” or “traveler room” with a variety of accessories belonging to multiple countries and areas of the world. Bring in some ethnic eclectic element in your home to add some charm and attraction as well as a chic and modern look in your home. Connect thread of different colors, tones and shapes in your home to go for an ethnic eclectic scheme. Make your living room more prominent by using different beautiful colors and shaped accessories from different territories. You have to do all the décor with care. You don’t have to add hodgepodge styles from different territories. Be creative and choosy. You can make your room beautiful by adding character, balance and cultural interest. The crucial points are your choice, care, attention and most importantly, balance. Posters or wallpapers of many world destinations perfectly fit into the scheme of ethnic eclectic. A destination oriented wallpaper or posters whether framed or unframed in a room add an ethnic eclectic touch in the room. Do you want to add some sort of a tropical look in your room? Bamboo pieces seem to be ideal for an ethnic eclectic room. 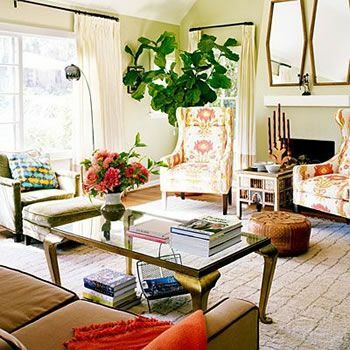 To add tropical look, place palm tree in the corners of the room or install bamboo ceiling fan. Woodsy wreath with bird’s feathers and other décor items is also another way to include forest atmosphere in your room. How can you forget rugs? Represent your love for culture or country by choosing a rug from a particular country. Go for rugsfrom the country you like the most. You can go for traditional rug styles and patterns from Peshawar Pakistan. Accent pieces are easy to find to decorate your room in ethnic eclectic scheme. A glass terrarium, lamps in different styles from different countries’ patterns, statue of the knight in armor, a Chinese doll wall hanging, painting of historical buildings, depression glass, coastal vintage glass bottles and many other options are waiting for you to make your room look beautiful and stylish in ethnic eclectic décor ideas. Place glass terrarium on table for natural and earthy look. Make your room fresh and lively by adding some natural outside beauty with plants and cut flowers in modern glass terrarium. A modern terrarium with natural green wild beauty can really spice up any traditional room. To avoid dread mess of a lot of accessories pick all accessories carefully and keep balance in your mind. Make your room bright with lamps. Decide what region of the world would you like to represent? To fit well in ethnic eclectic rooms, go for a lamp in the style of piece of pottery of South America. It is up to your taste.